I have done device testing, modeling and optimization on various antennae. 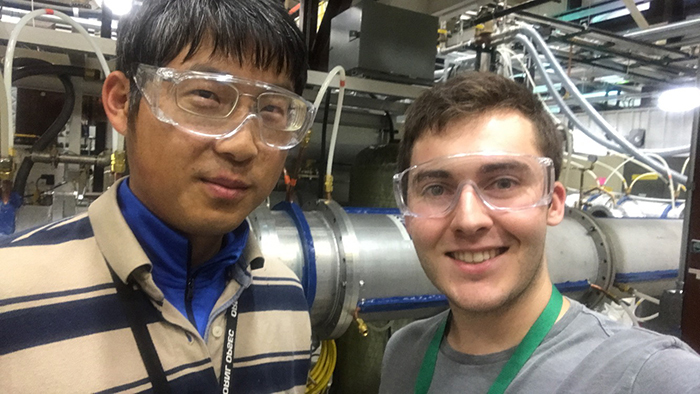 The aim is to build a new diagnostic to measure plasma mass density fluctuations on the high field side of a tokamak, a nuclear fusion reactor concept. This is my first major internship in science off campus. I have been accepted to intern in the fall semester at Princeton Plasma Physics Laboratory, where the primary focus of all of their research is fundamental plasma physics and nuclear fusion energy. Networking with prospective employers and colleagues has proven to be valuable already, but like most science internships, I benefited most from the practical skills I've had to acquire to do my research. I would say that networking beats just about any other way to secure an opportunity. I have benefitted most from putting myself out there and initiating contact with physicists and engineers working in my field on my own time. This internship is a taste of the self-directed learning and research that will define my life in graduate school and afterward. My internship in the fall will be similar, and after that I will know if research is the right career path for me. I plan to go on to graduate school to get my Ph.D. in plasma physics. I want to dedicate my career to developing energy technology that measures up to the growing needs of our increasingly power-hungry world.